Although you may think that your chimney is in excellent condition, there are visible signs that indicate a repair is needed. As a homeowner, knowing exactly when to have your brick chimney repaired will go a long way to ensuring the safety of the structure—and your home. There are also some less obvious visible signs that you all homeowners should be aware of, so they can get the damage repaired as quickly as possible. What should you look for to detect brick chimney damage? Damaged or Deteriorating Mortar Joints: Though you’ll need a rooftop view of the mortar for an accurate gauge of deterioration, mortar joints can lead to accelerated damage if left untreated. Water from both rain and snow can seep into a small crack in the brick, and during the freeze and thaw cycle, those small cracks become larger. Spalling: The process of expanded cracks is called spalling, and results in the thin layers of brick being separated from the face. You can find thin layers at the base of the chimney, and the issue should be immediately addressed. Spalling forces the masonry to pop out, and if left unattended will see complete destruction of the chimney. Crowns: When you see evidence of spalling, it could be due to the chimney crown. Problems are best spotted from the roof, and crowns will cover the brick up to the flue tiles. Like the mortar joints, cracks in the crown gradually grow and water that enters through the crown seeps into the liner. Crown coatings are used to avoid any problems, preventing deterioration and shrinking due to water damage. Firebox: Check your firebox for signs of moisture or deterioration. Moisture around the firebox is an indication that a chimney isn’t operating the way it should. If the damper becomes difficult to operate, and rust is present, moisture can cause flue tiles to crack. Flue lining damage could result in too much heat entering the fireplace and chimney, causing a house fire. Flashing: The flashing keeps rain or snow from going into the house where chimneys pass the roof. 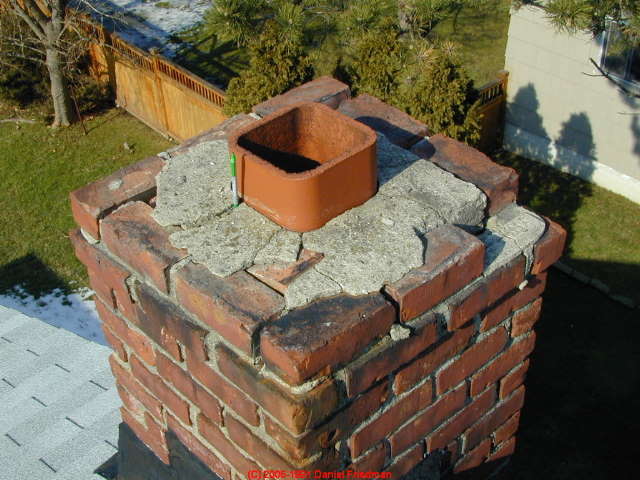 Flashing is mortared into the brick mortar joints, and holes or deteriorating issues that result in the flashing not being sealed into the chimney well can cause as many problems as the crowns. Problems can be detected when you’re on your roof or when a contractor is inspecting your roof. You should be alert to any problems that are associated with your chimney before the damage leads to destruction. Make sure to contact a professional chimney repairman or inspector to make sure all repairs and replacements are completed accurately and efficiently. This entry was posted in brick masonry on July 28, 2015 by above.